Most effective way to maintain a safe and healthier ambience at homes and offices is to keep your surroundings neat and clean. From the countless ways of keeping an environment clean, floor matting is one of basic way. A famous Saying “Cleanliness is next to Godliness” which means Being clean is a sign of spiritual purity and Goodness and is a residence of the all mighty. So let us know about Floor Matting. A Floor Mat is a piece of thick flat pad crafted with a fabric, foam or synthetic material, generally placed at floors to protect them from dust and rust. It is used to prevent floor from outside soil, dust particles, rust that comes along with your footsteps as you step in to your home or office premises.. Earlier, mats were made up of interlaced blades of grass placed at a 90-degree angle to form a web-like structure and were probably the first type of floor covering used by man. But nowadays, Mats come in varieties with respect to usage, material, color, purpose, quality, size and occasion. Why Floor Matting is Important and what does it do? · To absorb liquid expected to spill in the area. · Entrance or Welcome Mats: Entrance or Welcome mats are those mats which are generally placed at the entrance of a home or office. These are placed there to notify you to wipe out the soles of shoes before stepping in. These are general doormats made from tough, long-lasting material such as coir, Palmyra (palm) fibers and stalks, nylon, rubber and cloth. 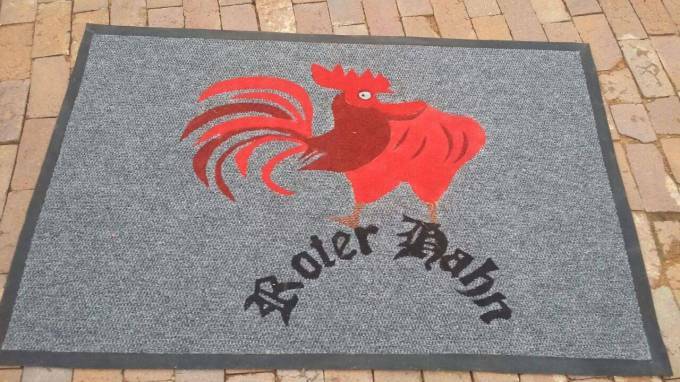 · Branded Mats: Branded mats are the mats which have the sign of a brand on the doormat mainly used to promote a particular brand. These are mostly used at the entrance of companies, restaurant and even shops. These mats have a long durability and are available in different corporate colors. · Plain Mats: Plain Mats are the dirt trap mats made up with cotton or microfiber having unique dirt trapping capability and are machine washable. Mainly used for kitchen and Washrooms having more than 5 year warranty. · Berber Carpets: Berber carpets are carpets hand-woven by the Berber autochthones in North Africa and the Sahara. The carpets come in traditional and modern designs, which are distinguished by different knotting patterns, dyes and fabric textures. · Modular Mats: Modular mats are Interlocking mats or tiles which resembles puzzle pieces fitted together seamlessly. Mainly used to interlock the spill of liquids like water. Ideal for wet and dry to seal the floor in areas like garages, railway stations. · Customized Mats: Customized mats are the mats that come in sets for dining table, cars, mouse pads basically come with brand name for brand promotion. Brandmat is a company in Johannesburg, South Africa which is a pioneer in designing high quality and variety of doormats. We design these doormats keeping in mind the quality of material used within an affordable price. We are available 24x7 in order to render you this service. Call on +27110566615 or email us at sales@brandmat.co.za for any queries and support.